Look I think MN East and West of the Hudson do a fantastic job dealing with 100+ year old infrastructure. Any form of transportation gets affected by weather, remember the sagging wires on the New Haven during the heat wave last year? Even sunny warm weather affects rail travel. People have to collectively chill when on a train that is confronting an issue (weather related, etc) and know through the fault of NO ONE they are stuck, deal with it. I have been delayed into NYC due to weather related issues. No reasonable person has EVER faulted me for calling/emailing then stating what is happening and letting them know I’ll get there when I get there. 99.9% of the time the issue with the train is NOT the fault of the train crew – they’re in the same situation you are. Let them do their job so you can get to yours. As long as the re-sequencing combination buffers have had a level 3 diagnostic performed on them in the last few days there should be no errors whatsoever in using the transporters to go to and from work….. Until then yes MN, NJTRANSIT, and LIRR still beat the alternative of driving in both cost and convenience. And if the responses from MN or twitter get you down while you’re stuck in a train do what I do, take off your shoes, put your feet up on the opposite seat, talk loudly on your cell phone and then curse and yell at train crew personnel while telling them how educated you are LOL! On hot days, the trains will sometimes be delayed in order that the tracks, which are subject to expansion and sun kinks, will not be excessively stressed by the forces of the train. On your New Haven line, the overhead wires are subject to expansion and sagging, which is also reason to take it slower. Sometimes, even the things the railroad does to improve things slows you down. In Chicago, mid-day trains sometimes run on a track that doesn’t have station platforms, requiring all passengers to unload or load through one door spotted over a road crossing. Then despite all precaution, sometimes a crane tips over and drops a signal bridge across the tracks, just before rush hour. Ah, you’re right. I failed to mention anything about heat-related delays. I can’t recall off the top of my head, but things get slowed down when the temperature reaches a certain level. Higher on the Hudson/Harlem and a bit lower on the New Haven because of those saggy wires. My father (no longer alive) used to commute from Crestwod to Grand Central. He always used to refer to the voice coming out of the speaker at the station (“Attention at Crestwood”) as the Voice of Doom. He probably was right about that. 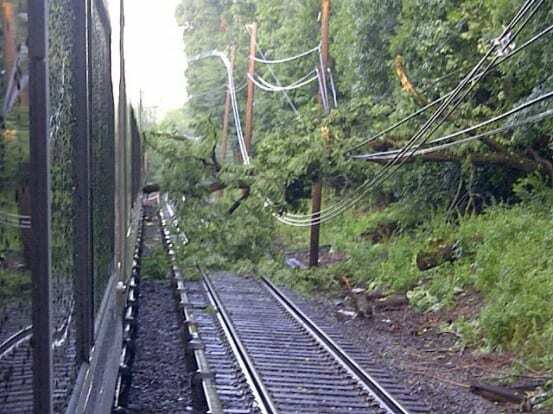 The railroad used to keep the trees clear from their right of way, which usually extends anywhere from 20 to 50 feet from the center of the tracks… For whatever reason, Metro-North has allowed trees to grow in the last 30 years and only cut them down once they fall. They could probably save a lot of grief by being aggressive with cutting now, rather than waiting for something to go wrong.